Aguas Dulces: Know for its awesome fishing and is located in the Rocha Department. I ate some fantastic seafood and a unique fruit called Butia. Santa Teresa National Park: The view here is breathtaking. There is a wonderful Fort known as Fortaleza de Santa Teresa and plenty of camping at the park which is run by the government of Uruguay. The whole family loved this one and my wife thought it was beeautiful. Montevideo Uruguay - the Capital city: Argentinians come here in droves over the summer and it is a favorite vacation destination for many. As the capital city you will find museums, history, culture and all the amenities of any modern North American city. It is well known for many things including the home of the central government and its beautiful white beaches. I especially enjoyed the fascinating architecture with influences from throughout the world. The Indian and Gaucho Museum: This historic center is located in Tacuarembo and is open Mondays to Fridays from 1 pm to 7 pm. Weekend hours are 2 pm to 6 pm - if my memory serves me right. Mercado del Puerto: If you want some action and interaction, check this out. 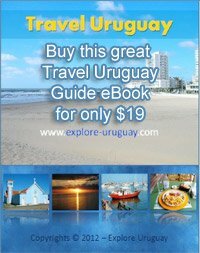 It has tons of authentic Uruguayan restaurants where you can sample lots of interesting Uruguay food recipes and bazaar is always crowded with tourists and local people of Uruguay. Colonia del Sacramento: One of the most romantic cities. With cobblestone streets, old architecture fantastic parks and quaint restaurants. The nightlife was pretty good too. Termas de Dayman: Located in Salto Uruguay. A health spa for the whole family with natural springs it is known for its healing powers for almost any ailment. The wife and I relaxed while the kids tired themselves out with all the water activities. Punta del Diablo offers Awesome fishing and Surfing! Colonia is defined on the actual riverside thus be sure to go walking round the shores and also climb the actual stairways from the lighting house to get good views from the area. Just wanted to say that Ive been to Aguas Dulces too and I agree. Its a beautiful place and one of my favorite places to Visit in Uruguay. I had so much fun there and met lots of interesting people!